When it comes to nerdy movie franchises, there are few that are more synonymous with the words "missed opportunity" than Fox's X-Men series. Abandoned by Bryan Singer after he helmed the groundbreaking 2000 original film and its 2003 sequel — both of which were instrumental in establishing Marvel characters as bonafide movie stars —the series has ranged from mediocre (X-Men: The Last Stand) to abhorrent (X-Men Origins: Wolverine) to just plain passable (The Wolverine). The only X-flick that captured the spark that made Singer's films so memorable was Matthew Vaughn's 2011 prequel X-Men: First Class, a movie that breathed new life into the aging franchise while introducing a host of all-new continuity errors. Although you might say the muddled timelines and overall inconsistencies make the films more true to the source material, it's not necessarily an aspect of oft-confounding comic book storytelling we want in our movie adaptations. 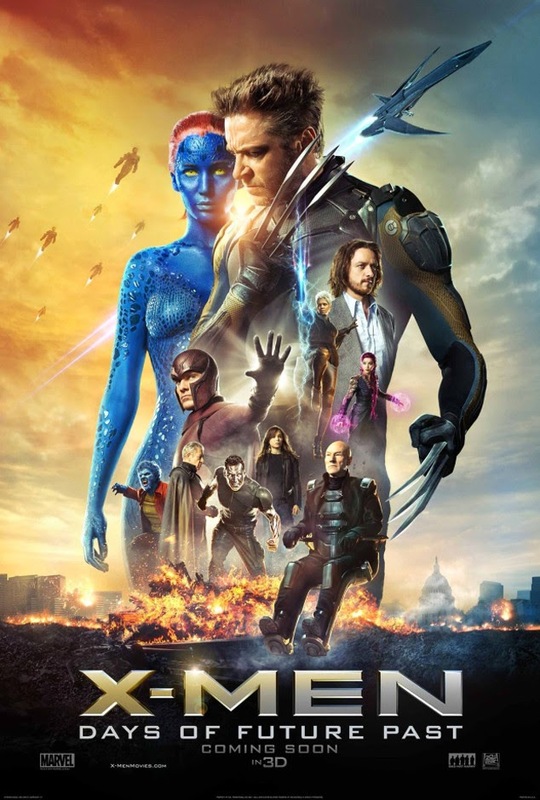 In an effort to make sense of it all and fix a franchise that's been broken for about eight years now, Singer returned to the X-Men series as director with Days of Future Past, a loose adaptation of Chris Claremont and John Byrne's iconic time-traveling comic book storyline of the same name. The film replaces comic protagonist Kitty Pryde with the movie franchise's poster boy Wolverine (Hugh Jackman), who must journey to the past to save mutantkind from extinction. One of the big draws in this installment is that it includes the cast from the original X-Men trilogy, including credibility magnets Patrick Stewart and Ian McKellan as Professor Xavier and Magneto, as well as that of First Class, namely the always impressive James McAvoy as young Xavier and the never-not-badass Michael Fassbender as the burgeoning Master of Magnetism. Central to the story this time around is Jennifer Lawrence's azure-skinned femme fatale Mystique, whose hatred for mankind sets into motion events that give rise to the Sentinels — government-sanctioned robots programmed to detain and eradicate "dangerous" mutants. How many Academy Award winners have done that? Newcomers to the series include Game of Thrones star Peter Dinklage as Sentinel creator Bolivar Trask and American Horror Story's Evan Peters as Quicksilver, a character responsible for one of the coolest moments in the film. Dinklage's Trask, meanwhile, makes for a powerful-yet-understated villain who fully believes he is acting in the best interest of humanity. Whether it's Trask or Magneto who is truly the antagonist of Days of Future Past is entirely up to you. The first question that fans might have going into Days of Future Past is whether or not Singer has "fixed" the frustratingly inconsistent X-Men movies. For the most part, he has. If you wondered why we saw a non-furry Hank McCoy on a TV screen in X2, even though Beast's mutation happened in the 1960s, there's a reason for that. Hell, the same explanation could also apply to Xavier's ability to walk at the beginning of The Last Stand, which was years after his paralysis. However, rather than tie up every possible loose end — like how Peter Dinklage and Bill Duke somehow play the same character in the same franchise — Days of Future Past gives us perhaps an even greater gift: a reset button. Without trekking too deep into spoiler territory, the film essentially wipes all of the middling X-Men movies out of existence. Sorry, Origins and The Last Stand. You never happened. Now, the doors are wide open for filmmakers to tell X-Men stories unhindered by the misguided decisions of previous writers and directors. But all that canon whitewashing wouldn't mean much if Days of Future Past wasn't an amazing experience in its own right, and it absolutely delivers on that front. Once you get past the inherent wonkiness of the time travel (which is always a bit messy), what you have is a solid X-Men film featuring big action, some outstanding visuals and a dynamic ensemble cast. For the first time, Fox's X-Men series is poised to stand toe-to-toe with Disney's Marvel Cinematic Universe, and that's saying something. X-Men: Apocalypse can't come soon enough. In a video promoting the "Force of Change" campaign, which offers the chance to win a walk-on role in Star Wars: Episode VII in exchange for donations to UNICEF, director J.J. Abrams gives us a peak at one of the creatures who will appear in the anticipated sequel film, Surprisingly, this creature is 100 percent practical, appearing more like something out of Jim Henson's Dark Crystal than one of the CGI-addled prequels, which is definitely a good sign of things to come. Also, what the heck are those things it's carrying? Babies? Pets? Food? To learn how you can contribute to "Force for Change" and be a part of the next Star Wars film, visit omaze.com. One week after unleashing "Battfleck" on the masses, Warner Bros. has released the official title for their Man of Steel sequel that pits Superman against The Dark Knight. 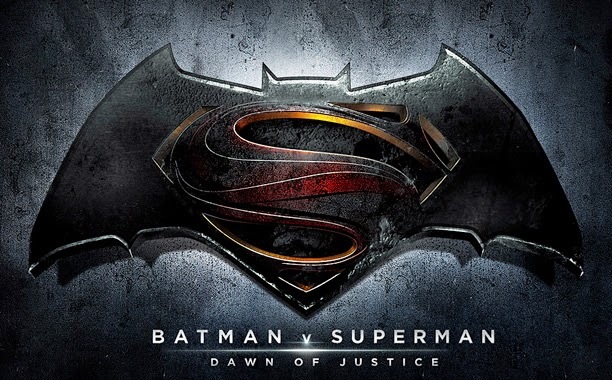 As reported by Variety, the 2016 film will be called Batman V Superman: Dawn of Justice. Not only is Superman billed second in his own sequel, but the Dawn of Justice subtitle really hammers home the fact that the primary purpose of this film is to establish the Justice League on screen, and is less about continuing whatever story Zack Snyder thought he was telling in Man of Steel. Joining Ben Affleck at Batman and Henry Cavill as Supes are Gal Gadot as Wonder Woman and Ray Fisher as Cyborg. Okay, Marvel. Now you're just showing off. Guardians of the Galaxy, starring Chris Pratt Zoe Saldana, Dave Bautista, Vin Diesel and Bradley Cooper hits theaters August 1. Warner Bros. and Legendary Pictures' Godzilla had a monstrous opening weekend, pulling in more than $93 million and ensuring that The King of the Monsters will soon wreak havoc on our movie screens again. Yet, before we look ahead to the already-confirmed sequel, just how was the Gareth Edwards' American revival of the iconic Japanese monster? If you follow me on Twitter (and, really, why wouldn't you? ), you know I was pretty disappointed in the film, which seemed to marginalize its title character in favor of two-dimensional stock characters and the real stars of Godzilla, the insect-like Massive Unidentified Terrestrial Organisms (MUTOs if you're nasty). Worse yet, whenever the film did bring us the monster-on-monster action we came to see, it would cut away to where the action isn't. Not cool, guys. I could go on and on, but in honor of Godzilla's country of origin, I've summed up my thoughts on the film in the haiku below. This morning, Batman vs. Superman director Zack Snyder tweeted out our first look at Ben Affleck in the Batsuit for the forthcoming Man of Steel sequel, and you know what? I kinda like it. 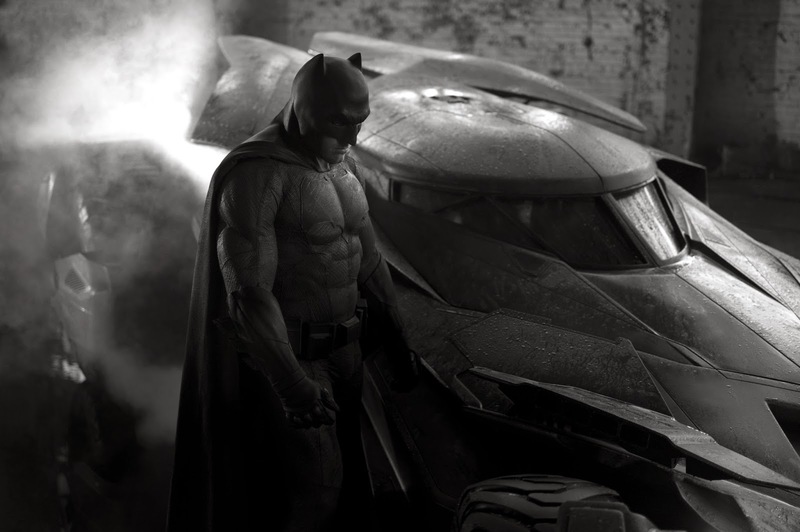 I know it's en vogue to bash this project (and rightfully so), but there's nothing about this image of Batman standing in front of a slick, new Batmobile that offends me. In fact, I like that the suit combines elements from the current "New 52" costume with the short ears and bulkiness of Frank Miller's vision of the character in The Dark Knight Returns. The embargo has been lifted for Warner Bros. and Legendary Pictures' monstrous franchise reboot Godzilla, The King of the Monsters' first cinematic stomp since 2004's Godzilla: Final Wars. So what did the critics have to say about director Gareth Edwards' attempt to revive this classic kaiju? The Hollywood Reporter: "Generally, Edwards honors the trust invested in him, taking his responsibility seriously, delivering the action goods and bringing it all in at a well-paced two hours. Where the film lets down is in the interpersonal scenes with the younger characters, which engage virtually no interest." Variety: "Godzilla movies, like wrestling matches, are ultimately judged by the quality of the mayhem, and Edwards excels at blowing things up." Time: "The title character looks imposing, in the CGI work of Peter Jackson’s Weta Digital sorcerers, but the movie is often so dark, using a palette of gray and brown, as if coasted in rust, that he’s hard to see. (The sound effects do most of the scary work.) And he gets little screen time. Godzilla isn’t even the main monster: he is the referee, rival or enabler — we won’t say which — to a pair of other creatures." IGN: "Legendary Pictures' Godzilla origin story carries the weight of unwieldy expectations, but rather than buckle, it is ultimately a fantastic - though imperfect - example of the genre. 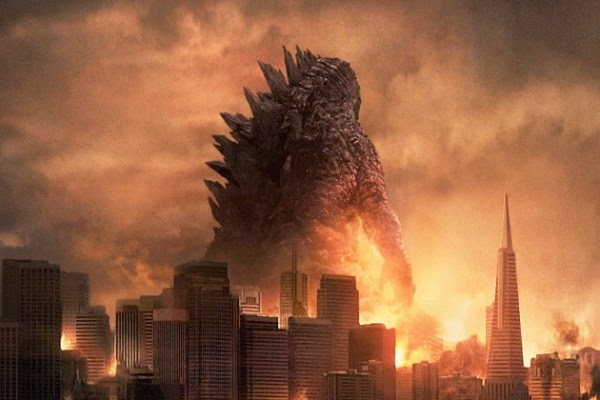 Gareth Edwards both depicts what is beloved about this magnificent creature and creates a film that is distinctly its own entity, one that brings Godzilla to gorgeous new life." Empire: "As you’d expect, Edwards excels in creating awesome kaiju juju — be it toppling aircraft like dominoes or Godzilla swimming under a battleship — that always leaves you wanting more until the battle for San Francisco delivers on the promise. This is not the men-in-suits wrestling we’ve seen before; instead it’s a beautifully shot (very Apocalypse Now-y) and choreographed smackdown that, for once, doesn’t feel like a bunch of pixels hitting each other." The early reactions are encouraging, but Time's critique that Godzilla isn't "the main monster" is a bit discouraging. That said, it seems as though reviewers were mostly impressed by the special effects-charged action — the main reason we're all excited about this movie. Judge Godzilla yourself when it hits theaters this Friday. Why Do We Hate 'The Amazing Spider-Man 2'? My hopes weren't the highest for The Amazing Spider-Man 2, the second installment in Sony's totally unnecessary reboot of the Spider-Man movie franchise. I wasn't in love with the first movie, and I was already under the impression that Marc Webb's web-slinging sequel was buckling under the weight of its super-villains based on the trailers. Then I saw The Amazing Spider-Man 2 on opening weekend. Twice. So yeah, I dug it. 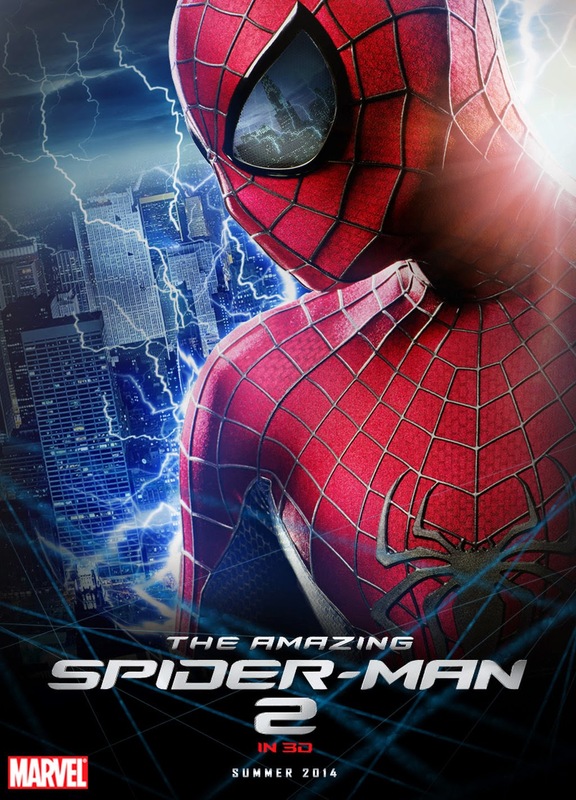 The relationship between Andrew Garfield's Peter Parker and Emma Stone's Gwen Stacy captivated me, and Jamie Foxx's transformation from socially awkward nerd to electricity-spewing bad guy was a lot of fun, if a tad on the hammy side. Dane DeHaan was convincing as Peter's estranged buddy Harry Osborn, who plays a critical role in the film's pull-no-punches finale that changes our hero forever. Although The Amazing Spider-Man 2 is unquestionably the best Spider-Man film in a decade (and if you go back and watch Sam Raimi's Spider-Man 2, it doesn't age all that well), it's already become popular to bash it. The film received a dismal 55 percent rating on RottenTomatoes.com, and Twitter has been equally unkind. Are we bitter that Spider-Man remains in the clutches of Sony, preventing The Wall-Crawler from joining Marvel Studios' interlocking series of films? Are we longing for Raimi's vision of Spider-Man? Or are we perhaps suffering from Spidey fatigue after five films in 12 years? Let me know what you think on Twitter using #TheWortReport.